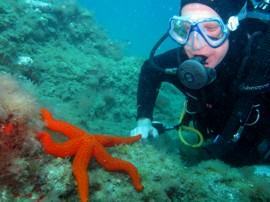 Where better to learn about diving with enriched air mixes (Nitrox or EAN) than in a Marine Reserve in Spain?. This course takes you through all aspects of planning and undertaking dives which involve the use of Nitrox, and then takes you on some great dives to try it out. Nitrox is an enriched mix of normal air and oxygen for scuba divers, and it lets you dive for a longer time at a given depth without an increased risk of decompression sickness. It is not however a gas that lets you go deeper - in fact with Nitrox you have to be much more aware of your maximun depth. During the theoretical part of this course we explain why this is, and show you how to manage your nitrox so that you can dive safely with it. You then get two great dives in Gran Canaria's El Cabrón marine reserve, where you can taste it and test it properly so that you see the practical effects of using nitrox. Our team of PADI Elite Instructors are mature, knowledgeable and highly rated on TripAdviser! You start by learning about Nitrox and how to analyse it. You then build on these basic skills and practice them both in the sea, all the time under the supervision of one of our qualified and experienced PADI Instructors. All the teaching and support materials are used to ensure that you understand the simple physics behind NITROX and to give you the confidence and enthusiasm to continue diving after your course. In addition to the prescribed skills we aim to develop your confidence in the water, so that you leave us as a safe, competent and qualified diver. 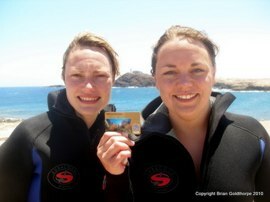 Must have a minimum of PADI Open Water qualification or equivalent. You do not need to have taken a PADI course in the past, so if you have a BSAC, SSI, NAUI, CMAS or other qualification you can still take this course. You must be over 15 years of age. After some introductory theory you plan and complete your first dive, where we taste the difference in diving with Nitrox. After a review in the dive centre, it is back out to the sea for a second dive where we fine tune the procedures for safe diving with Nitrox. The course covers planning dives with Nitrox, the use of Nitrox tables, oxygen related diving medicine, preparing to dive with Nitrox, and the handling of tanks before and after diving. The course has recently been updated by PADI and there are now two main strands, the first is using tables when diving with Nitrox and the second is using your Nitrox dive computer. Free use of Nitrox Dive Computer! PADI recommend that all students on this course get to use a Nitrox dive computer as part of their training. The dive computer monitors depth and duration constantly, and calculates a maximum operating depth and remaining dive time to avoid decompression illness, and helps monitor ascent rates. 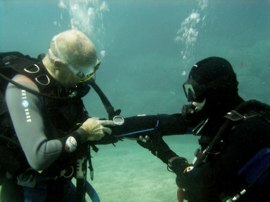 Using a dive computer with Nitrox contributes to increased diver safety and more enjoyable dives. At Davy Jones Diving, we include the use of the Nitrox Dive Computer for part of your course Free of Charge, so you can understand how to set them and how they can help you manage your dives. This is a one day, two dive course. All transfers included. At the end of the course you will be awarded the "PADI Enriched Air Diver Specialist" qualification. This allows you to rent and use Nitrox fills up to 40%. PADI Open Water Divers will be able to count one of the dives towards their Advanced Open Water qualification, and if you are aiming for the PADI Master Diver qualification, this will count as one of the five specialisms required. 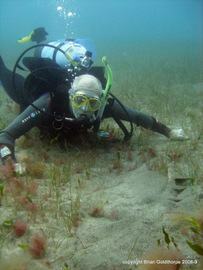 Enjoy yourself on more adventure dives using Nitrox! 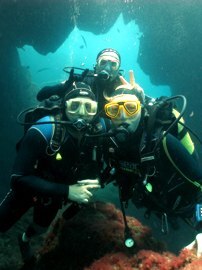 Take further adventure dives with us in the El Cabrón Marine Reserve to explore the beautiful underwater scenery of Gran Canaria, or gain another 'speciality qualification'. The price of obtaining your PADI Nitrox Qualification in the marine reserve at El Cabrón is €155 per person including registration with PADI as an Enriched Air Diver, who will then provide a training qualification card. We recommend that every student get their own copy of the new PADI Enriched Air Nitrox manual, priced at €25. If you want the full set of Nitrox tables as well as the manual there is a PADI pack available for around €45 depending upon language and options selected. We recommend that you should have a minimum of your own mask, fins and snorkel, and all other equipment can be hired on a daily basis. The price includes two dives with equipment, Nitrox charges, all logistics, collection and return and PADI Registration fees. You can fill in the Express course enquiry and reservation form or use the information on our contact page to email or call us to enquire about or reserve a place on your course.